This guide is a prerequisite for many of the Lotus tutorials on this site. 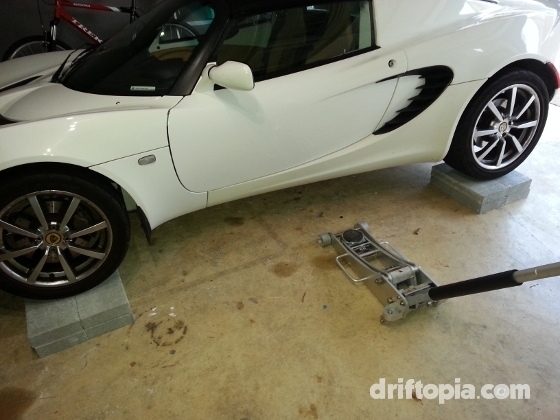 Placing the Lotus Elise on jack stands is a little trickier than most production cars. Due to the Elise’s design and flat underbody there are really only 8 designated “safe” lift points. Also, since the Elise has an extremely stiff chassis, I have found that a “stepping” method is the safest procedure to place the Elise on the stands with minimal risk of damaging the underbody. Pictured below is a diagram of the Elise’ lift points from Lotus. We will be working with points A, B and D in this guide. Diagram from the Lotus Elise owner manual showing the lift points on the chassis. I can’t stress enough the importance of high quality jack stands for the Elise as you will need some sort of flat topped stand to avoid damage. I highly recommend the flatJACKS from Sector111. You will also need a good hydraulic jack, preferably a low profile aluminum one as well as 8 concrete cap blocks for the “stepping”. Concrete cap block is sold at your local hardware store and are typically 8in x 16in with a 1-5/8in rise. Before you lift the Elise you will need to remove the undetray and rear splitter and determine if the wheels need to be removed. If you want to remove the wheels once the car is on the stands, go ahead and break the tension (but don’t remove) the lug nuts. First we are going to locate the lift points of the Elise. 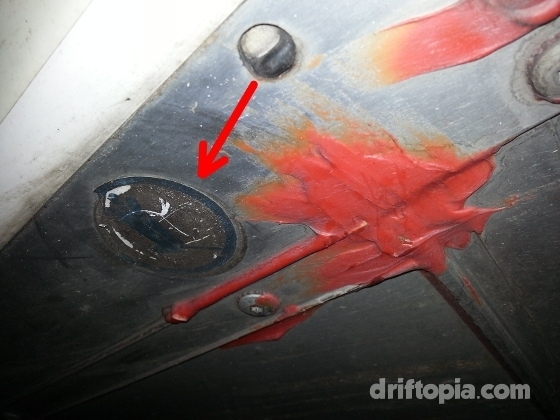 Points A and B are denoted by black circle stickers on the underbody. Point A is located in front of the rear wheels on each side. Point B is located just aft and on the inside of the front wheels. 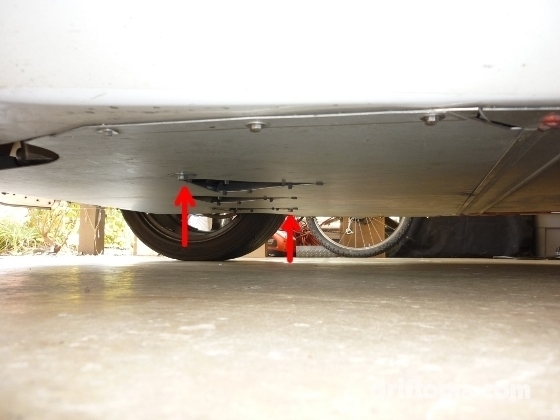 Points D are located on either end of the rear subframe where the wishbone mounts. Lift points A and B are denoted by these black circlular stickers on the Lotus Elise. You will lift the car at the mid jack point (A). Center the hydraulic jack’s pad under the sticker at A and lift one side of the car high enough to slide the cap blocks under the front and rear wheels of that side. Once the blocks are in place lower the jack until the wheels are resting on the blocks. 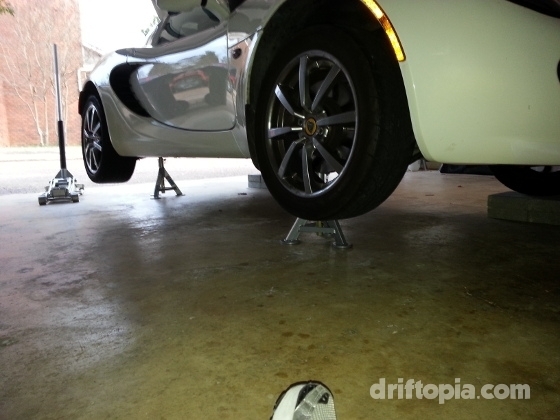 The driver’s side of the Lotus Elise resting on the cap blocks for the “step” phase. 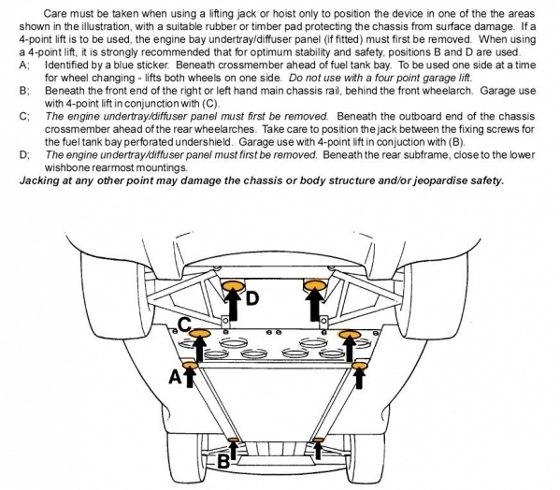 Now move the jack to the corresponding lift point (A) on the other side and lift the car high enough to place the jack stands at the forward (B) and rear (D) lift points. 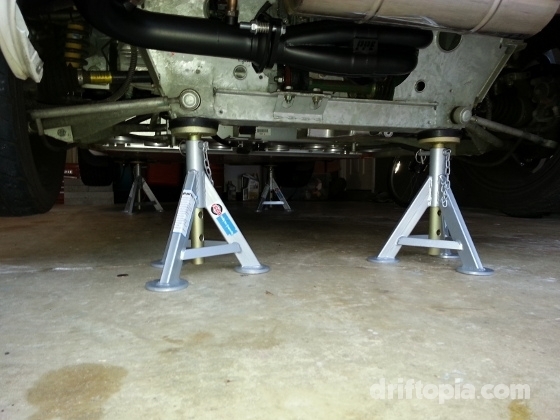 With the stands in place, slowly lower the car onto the stands, ensuring that the stands are centered on points B and D.
The image shows the passenger side of the Elise resting on the jack stands while the driver’s side is still at the “stepped” height. 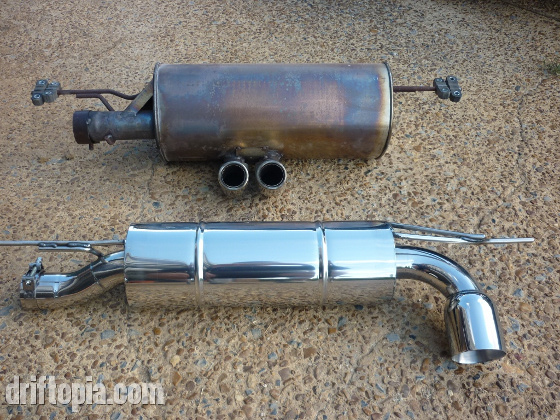 Next, return to the other side of the car and lift it until you can place the last two jack stands on this side’s forward (B) and rear lift (D) points. Once again, lower the car paying special attention that the stands stay under the lift points. 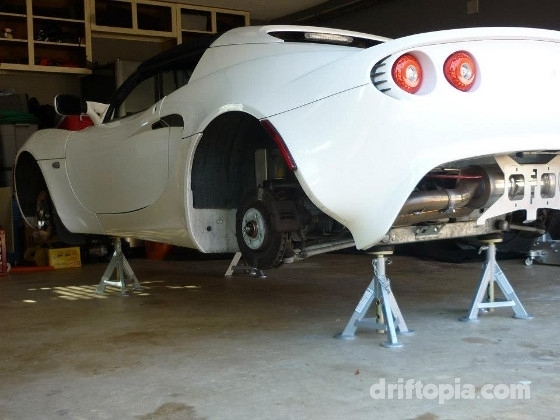 All four corners of the Lotus Elise lifted on jack stands. Notice the positioning of points D on the subframe. 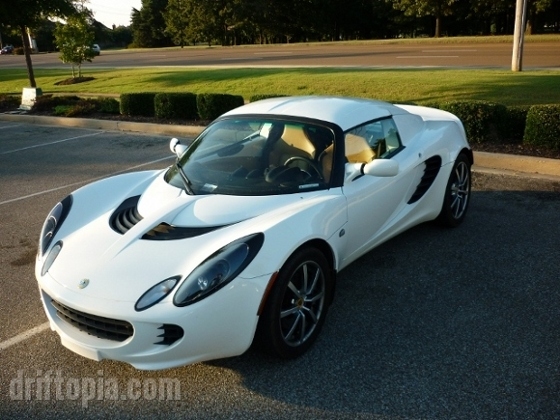 Alternate image of the Lotus Elise on jack stands.